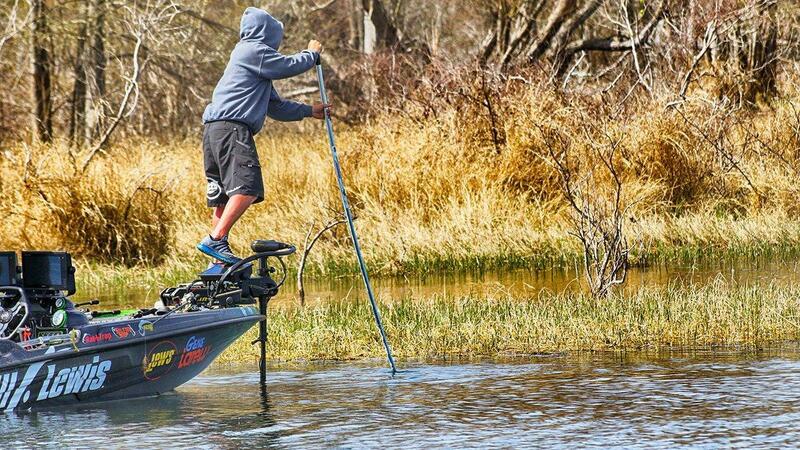 Trolling motors and Power-Poles definitely help with shallow fishing, but when you just need a little nudge, a slight repositioning, and the ultimate stealth approach, a push pole can be your best buddy. Upshaw’s choice is the T-H Marine Money Pole, a 6 to 18-foot telescoping pole with a coiled tip for retrieving snagged baits. Removing the coil and pushing with a pole he can collapse and store in his rod locker makes good use of a tool he’d carry anyway. Whatever your choice, mind these points for better performance. Generally, push poles are like a ship’s thrusters; they help with precise positioning needs like inching into range of a nervous bed fish or clocking around for the optimum sun angle or simply lining up a different presentation to irritate the fish. 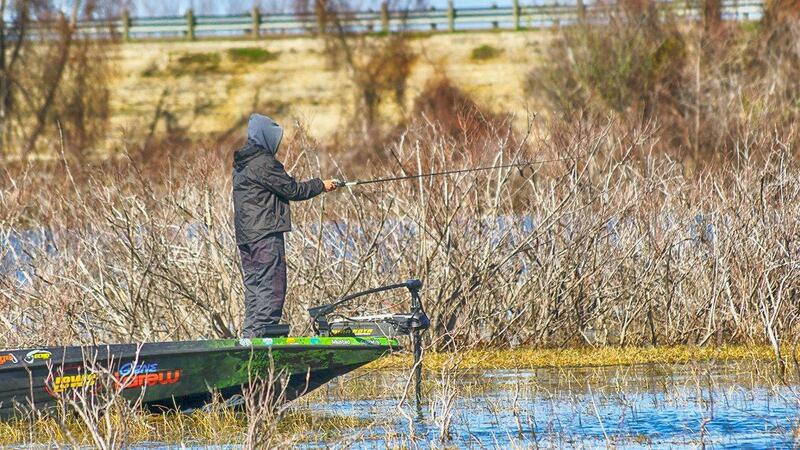 For bass anglers, making significant moves with a push pole is a situation-specific deal. For the proper balance of stealth and power, Upshaw stresses diagonal over vertical. “Putting the tip of the pole out at a farther distance gives you more stability,” he said. “I never hold my push pole straight up an down. Keeping the pole at a 45-degree angle, it’s not going to drag or scrape bottom; it will let you push back into the places you need to reach really quietly. And don’t think that a push pole is only for pushing. One of Upshaw’s tricks for silent and targeted movements is to reach in front of the boat with the pole at a 45 and actually pull himself on track. 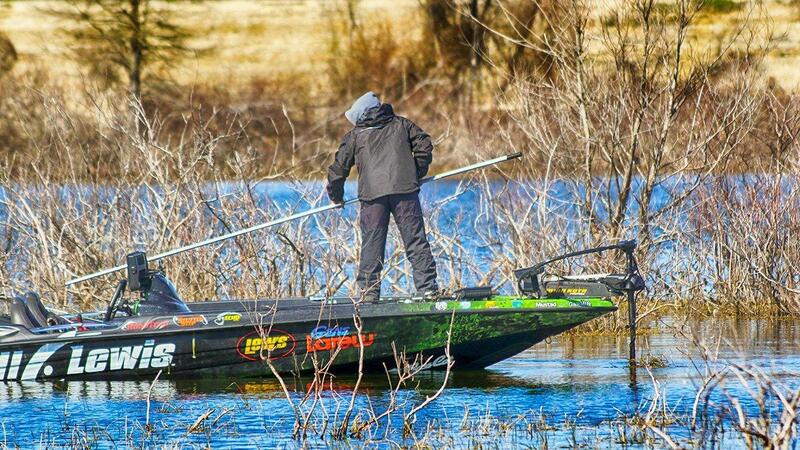 Probably the biggest mistake Upshaw sees anglers making with a push pole is using it like an oar on the side of the boat. So, you’re push poling into position, maybe making a minute adjustment, and Bam! The fish decides she’s had enough of the intruder and red lines her aggression. How do you manage the push pole and handle the rod? “I may try to wrap my knee around the pole, or a may tuck it under my left arm, but to put it bluntly, it’s a cluster,” Upshaw said. “A fish can bite at any time and your number on priority is catching the fish. 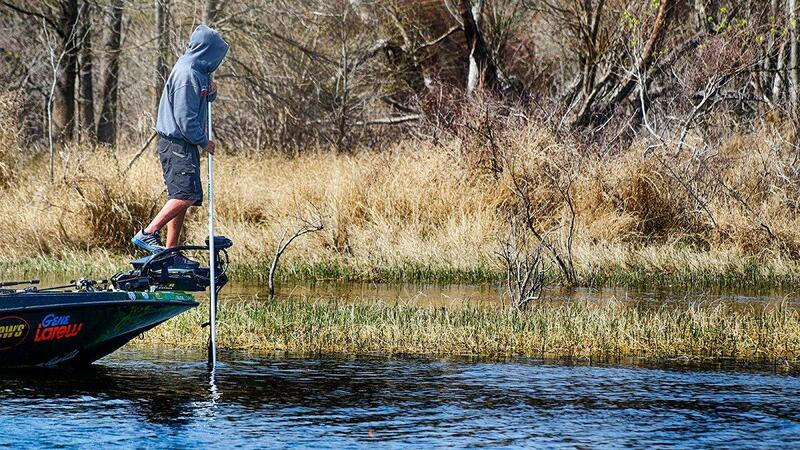 If your push poles goes in the water, then it goes in the water. 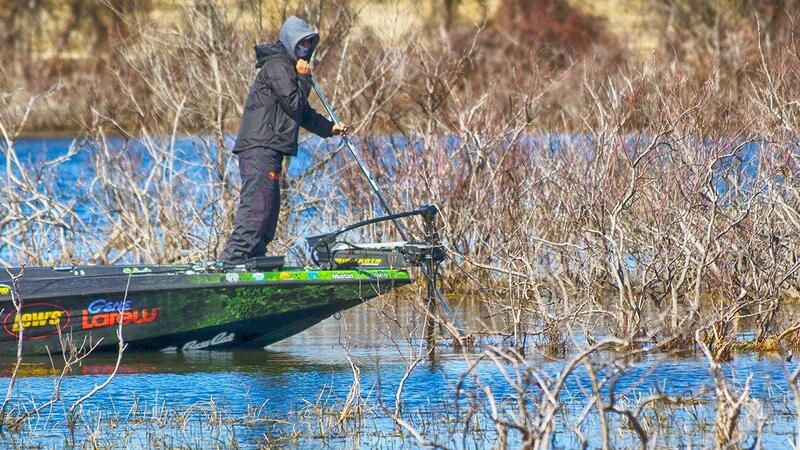 “Normally, if I’m on a big fish, I’ve already put my push pole down and I’ve dropped my Power Poles. But, given the circumstances, I’ll just drop it in the water. That’s just part of it.